We all know that kale is the new super food everyone is talking about - and with darn good reason! Kale is high in fiber, iron, antioxidants and vitamin k, and is low in calories. Another favourite vegetable of mine is brussel sprouts. I know they often get a bad rap, but I love the bold flavour and texture, as well as the fact that they are another nutritional powerhouse. Combined, these two ingredients, along with a few others, make a super salad that is filled with nutrients and taste. I've created the recipe as a side that serves 4 people. 1. Mix together the dressing ingredients and place in fridge. 2. 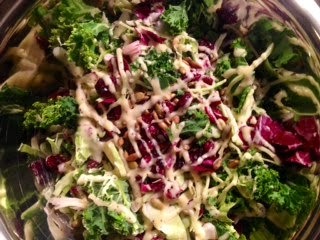 In a large bowl combine the kale, brussel sprouts, radicchio, and dressing. Toss together. Place in fridge and let sit 5 minutes. 3. Before serving add the pumpkin seeds and the dried cherries.